Honolulu, Hawaii (USA) -- From monumental events to the most mundane of daily tasks, Buddhists believe that all life experiences are opportunities to work toward enlightenment. 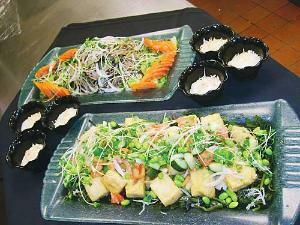 Annon Cafe's vegan dishes include Soba Salad, top, Tofu Poke and Haupia Pudding in the little black dishes. The experience of food is no exception. To share the Buddhist perspective on cooking and eating, Honpa Hongwanji Mission of Hawaii is opening Annon Cafe, to be set up in a corner of Tsukiji Fish Market & Restaurant at Ala Moana Center. The special cafe is part of a celebration for Jodo Shinshu Buddhists in Hawaii to commemorate founder Shiran Shonin's 750th memorial and the 120th anniversary of Jodo Shinshu's presence here. As with everything else in Buddhist practice, the preparation, choice and even consumption of food is laden with spiritual significance. "Annon," meaning peace and tranquility, is in line with the vegan Buddhist fare called Shojin Ryori, which is being offered at the cafe. Shojin Ryori embodies the concept of food and cooking that sustain the body in working toward enlightenment. On the menu: hijiki and soba salad, roll cabbage with tofu, nishime, chirashi and Hawaiian-style coconut curry with vegetables. "We tried to create an American-Hawaii style of vegetarian food that's nontraditional and uses local ingredients," said the Rev. Earl Ikeda of Puna Hongwanji, who worked with Tsukiji chefs to come up with an extensive lineup of dishes. "To duplicate what's used and served in Japan would be too complicated and too costly. We're using local products, so it's much more universal." Shojin Ryori has its roots in China, where monks based their vegetarian diet on the concept of no killing. From there the tradition spread to Korea, then to Japan. "Prior to this, Shakyamuni (Buddha) literally ate everything given to him. There was the practice of receiving alms with gratitude," Ikeda says. Shojin Ryori originated with the Soto Zen master Dogen, who traveled to China in the 13th century to study Buddhism. Dogen felt cooking was an important part of the discipline, and wrote the "Tenzo Kyokun," instructions for monastery cooks, which outlined everything from attitude while cooking to selection of flavors and colors of food. "The most important in this cooking is attitude and philosophy," says Ikeda. "You don't carelessly take a life, and that extends to your own life. You don't take it for granted. 'Narikireru' is a Zen term that means having the attitude that you are what you are cooking. How would you want to be presented? "When Buddhists sit down to eat, we say 'itadakimasu,' which literally means 'to receive,'" he continues. "We put our hands together in reverence and say 'itadakimasu,' reflecting on how lucky we are to receive these nutrients. It's the mindset that countless lives were taken so that I can sustain my own."